Photo courtesy of Bodegas Fundador. The occasion served to celebrate the acquisition of the 286-year-old brandy production facility, as well as several vineyards, cellars and other distilleries. The special ceremony was attended by Jerez de la Fontera Mayor María del Carmen Sánchez Díaz, members of Dr. Tan´s family and other officials of the Alliance Global Group, Inc. 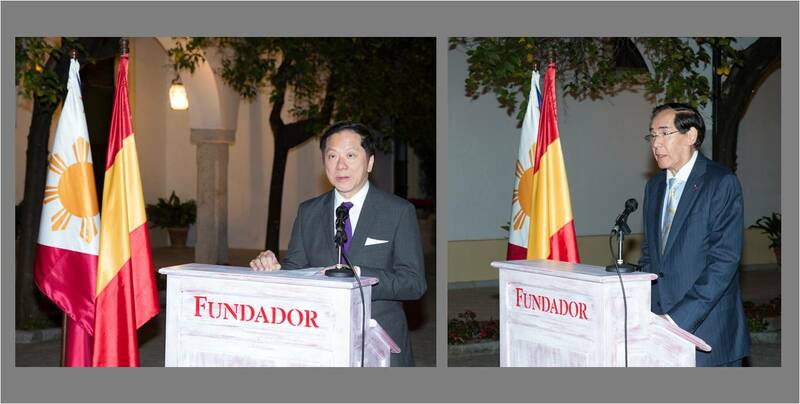 In his short message, Dr. Tan expressed his commitment to create opportunities for innovation and creativity in Spain´s brandy and sherry industry and stated that this is not just the beginning of a new era for Bodegas Fundador, but the whole brandy and sherry industry in Spain. On the other hand, Ambassador Salinas stated that this acquisition of Bodegas Fundador underscores the continued increase of commercial exchanges between the Philippines and Spain. The expansion is not merely a testament to the growth of Grupo Emperador as an important player in the industry but, more importantly, an earnest effort to uplift national pride with its globally competitive products and services. He also expressed confidence that this collaboration will accelerate the emerging strength of Filipino-Spanish ties not only in history, but also in industry and tourism. This development effectively established Grupo Emperador to stand out as the world´s best and largest company in brandy, and, the leading Philippine investment in Spain.